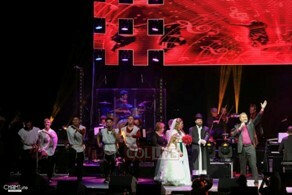 On November 13th, 3,000 people gathered in Kings Theater in Brooklyn, New York for ‘The Power of Jewish Unity’ concert, featuring Jewish superstars Gad Elbaz, Dudu Fisher and Nissim Black. The night’s theme focused on Jewish continuity, emphasizing the strength and survival of the Jewish people. So, what could be more fitting than incorporating into the evening’s progam, a wedding between the descendants of Holocaust survivors. A match made by popular Jewish matchmaking site, SawYouAtSinai.com. 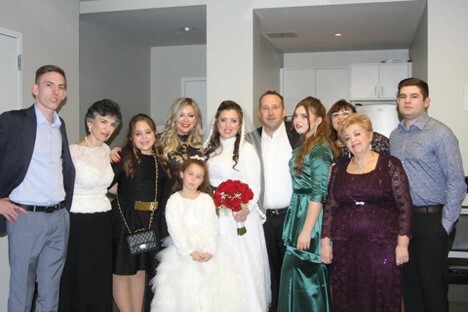 Pesach Charni’s family fled Vienna when Austria was annexed by The Nazis, whilst his bride Avigail Chazin grew up in Kiev, Ukraine, discovering only at 13 that she was Jewish. Avigail says her first step to pursuing a Jewish life was to find a Jewish partner. She signed up for various Jewish dating sites, and comments ““One of the websites was SawYouatSinai, that for us, became a sell fulfilling prophecy”. Shortly after their engagement, they heard that the concert’s producers were looking for a couple to get married on stage, and were immediately on board. "Our people had so many tragedies and we shed so many tears, that when we have a joyous occasion you want to share it with everybody, and you want to make it loud and invite as many people as possible," Avigail said. 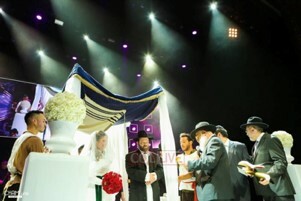 Thousands of Jews from all backgrounds, were taken by surprise, as the performers cleared to stage to make way for a beautiful white chuppah. 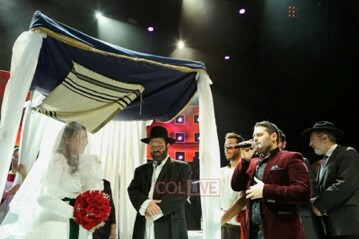 Avigail walked down the aisle to meet her Chosson (groom), as world renowned Israeli singer Gad Elbaz sang the popular wedding tune “Boi Kallah.” The audience filled with excitement, and was visibly moved by the couple’s ceremony. One Holocaust survivor that was watching even shared that this was the first time she had felt truly acknowledged.